Life in ancient history looks extremely difficult by modern standards. There were so many unknowns that have since been resolved that you wonder how people made a go of things. 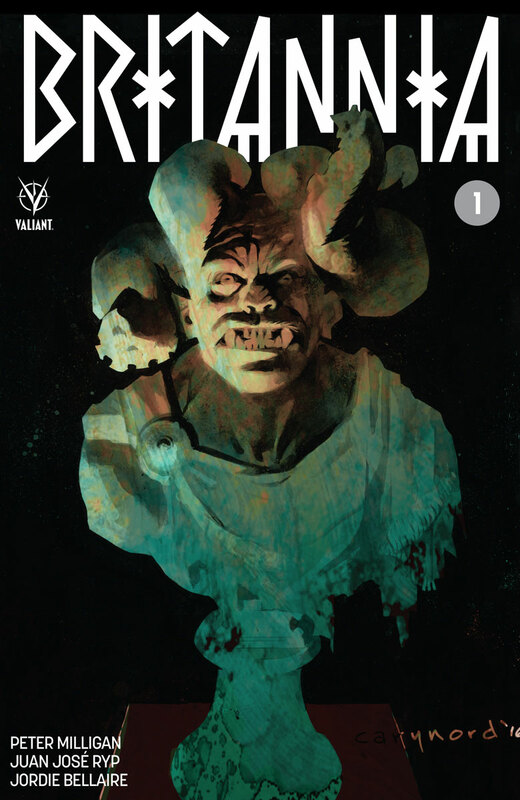 Valiant Entertainment isn't exactly one to make things easy for their characters and that's the case in Britannia #1. The issue is written by Peter Mulligan, illustrated by Juan José Ryp, colored by Jordie Bellaire and lettered by Dave Sharpe. Ruled by the Fates. Manipulated by the Gods. Commanded by Caesar. In the year 65 A.D., one’s destiny was not his own. At the height of Nero’s reign, a veteran of Rome’s imperial war machine has been dispatched to the farthest reaches of the colonies to investigate unnatural happenings. In the remote outpost of Britannia, Antonius Axia – the First Detective – will become Rome’s only hope to reassert control over the empire’s most barbaric frontier…and keep the monsters that bridge the line between myth and mystery at bay. Kudos to Mulligan--he took the concept of a noir detective story and worked it into the Roman Empire. Britannia #1 boasts a lot of history as Mulligan sets the table for the reader, but it's not so much that it becomes dull. In fact, Mulligan ensures that each of the main players have very distinct personalities that tie into their historic counterparts to some extent. Nero is characterized as a petulant ruler who enjoys torturing others while Antonius' belief system is expanded by things he encounters. Mulligan paces the issue in a way that builds up slowly to a pretty crazy ending while at the same time giving the reader plenty to take in. The illustrations in Britannia #1 have an appropriate Roman flair to them. Ryp illustrates the characters in a way that is grounded in history as he pays attention the accuracy of their look. Antonius looks the part of a Spartan soldier with an emphasis on his physique while Nero looks the part of a boyish emperor with an emphasis on his short-temper. The scenery plays out great as well, particularly one sequence of panels where there's a fog covering the action that looks alarmingly realistic, bringing the reader further into the mystery. Bellaire's colors all fit the Roman aesthetic as she emphasizes the reds and golds that define their power. Britannia #1 is a first issue with some interesting twists and turns. Antonius is investigating something peculiar set against the backdrop of a country ruled by a seemingly fiendish man imposing his will on the country. Mulligan is clearly taking some liberties with the historical accuracy of things, but he does so in a way that still fits within the belief system of the Romans. Ryp's artwork makes the characters feel larger than life and as if they have a physical presence to them. 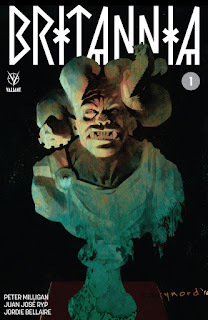 Britannia #1 asks enough questions to pique a reader's interest while also offering a somewhat accurate look at Roman life. Britannia #1 is in stores now.